It was a dark and stormy night, always tends to be the setting for a good murder mystery. 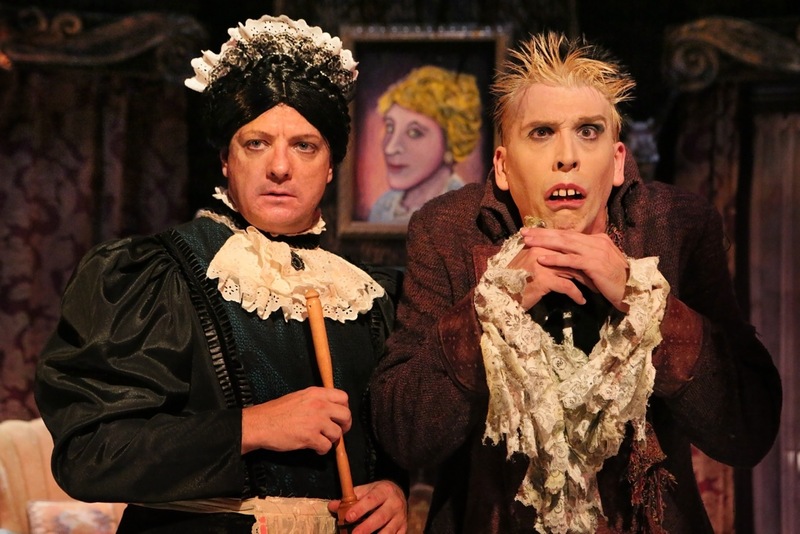 This is no exception in the case of “The Mystery of Irma Vep”, at The Jungle Theatre. After a wildly successful run 2010, the show is back at the Uptown theatre. The curtain rises on the Mandacrest estate on a dark and stormy night. Caretaker Nicodemus (Bradley Greenwald) and dutiful maid Jane (Stephen Cartmell) discuss the history of their employer Lord Edgar and his late wife Miss Irma Vep. As the show unfolds we are transported to the tombs of Egypt, taken on a hunt for a werewolf and discover truth behind the mystery of Irma Vep. Laughs come at a rapid fire pace and often in this play. If you spend too much time thinking about the joke you were just laughing at you’ll probably miss the next one. This Victorian-era melodrama is once again directed by Joel Sass and is complete with split second costume changes, sight gags and cleaver theatrical magic. With two actors, portraying six characters to say the play is demanding is an understatement. Bradley Greenwald reprises his roles in this two person extreme satire play. Greenwald is in his element with this show. From start to finish the show is full of over the top exaggerations and full force physical comedy. Stephen Cartmell is the newcomer to this production, but you’d never know it. His characters are brilliantly polished and his chemistry with Greenwald is fantastic. Most of the time the backstage crew of a show doesn’t get the praise and recognition they deserve. Shows won’t work without the hard working backstage crew and the running crew of this show, deserves a huge shout out. Without them Greenwald and Cartmell would never be able to complete their split second costume changes they have throughout the show. These changes don’t only include changing clothes, but also wigs, hats, teeth and makeup. In addition the changes occur while the actors are running from exiting stage right to making their next entrance as a new character on stage left and vice versa. If you’re looking for a great way to spend a few hours laughing, go see “The Mystery of Irma Vep” at The Jungle Theatre. The show is playing through October 19. I wouldn’t be surprised if the run was extended. For more information on the show, visit The Jungle’s website. Thank you. Such nice words. Come again and then you can hear all the jokes.